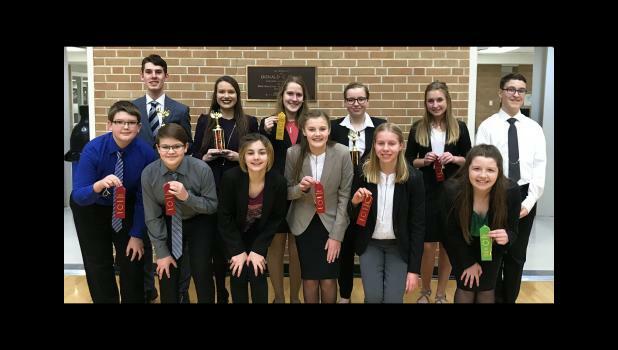 The River Valley Speech team started their tournament season with a group attending Saturday’s Worthington Trojan tournament. Tonn tied for first place in Informative Speaking. Grace Pingeon placed second in Drama. Elijah Kirschstein placed third in Original Oratory. Meriah Kirschstein placed fourth in Extemporaneous Reading. Kiera Lafferty placed fifth in Prose. Many students earned red ribbons. They are Mogen Winkelmann and Jack Scheitel in Duo, Ellie Tonn and Bryn Gordon also in Duo, and Layla Schwarzrock in Poetry. This year’s River Valley Speech Team is composed of almost 30 students from both Sleepy Eye Public and Springfield Public Schools. Coach Darcy Hoyt is very pleased with the success that her first-year members had at this tournament and looks forward to their future in speech. Next Saturday, Feb.9, the team travels to Minneota for their invitational. This year’s coaching staff includes head coach, Darcy Hoyt, who is being assisted by Springfield’s Cody Schwartz and Elizabeth Wellmann.